There are a number of accessible sites along the Gibb River Road. In most cases they can be found around the numerous gorges where there are usually bush walk tracks leading to a waterhole, e.g. at Adcock Gorge, Lennard Gorge, Galvins Gorge, Manning Gorge and Barnett River Gorge. 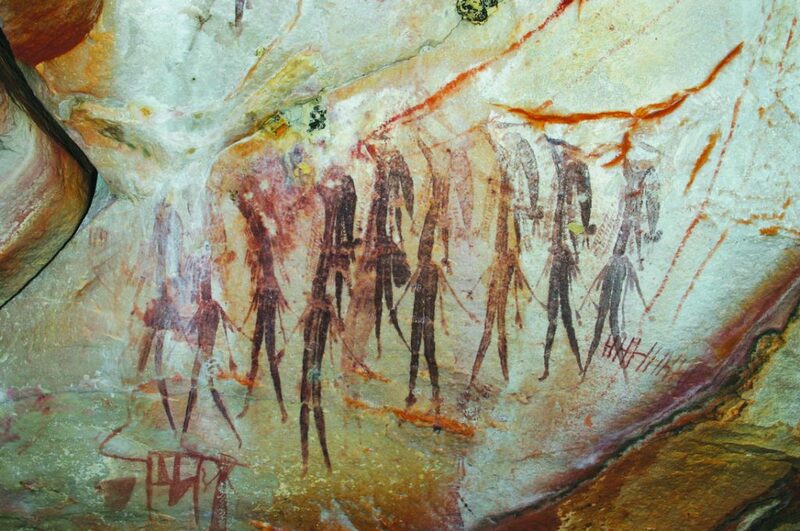 A visit to Mt Elizabeth Station is an attractive place to see rock art. The traditional owners from Dodnum, close to Mt Elizabeth, will sometimes take tourists to see their art. Further north on the Kalumburu Road/Mitchell Plateau Road there are two excellent sites known as Munurru with both Wanjina and Gwion (Bradshaw) figures. We suggest you purchase the book by David M Welch called Aboriginal Paintings at Munurru. His book can be found in local bookshops or at Roadhouses along the way. At Mitchell Plateau there are excellent walks where rock art can be found. The Department of Parks & Wildlife (DPaW) Rangers or the Kandiwal aborigines will direct you to places where rock art can be seen. A superb book on rock art of the Mitchell Plateau region is available online at Wildrocks Publications. Rangers and guides at Kalumburu are sometimes willing to take tourists out to their art sites. This can only be arranged once you are in Kalumburu and there are traditional owners available. There is also a local art gallery where the artists sell their paintings. Further up the Gibb River Road, at Ellenbrae Station, there is a small rock art gallery which can be accessed from the campground. El Questro, on the Pentecost River has some sites, but it is only permissible to access these sites with the traditional owners. There is no access for visitors to view rock art on Drysdale River Station, Doongan or Theda Stations. Rock art enthusiasts and bush walkers should contact the Kalumburu Aboriginal Corporation for permission to visit the Drysdale River National Park. Custodians of the DRNP are the Balangarra people. KFA receives many enquiries about visiting these ancient rock art galleries. Most rock art sites are not accessible to tourists. They are situated on Crown Land, Aboriginal Reserves, Pastoral Leases or Special Leases and Department of Parks & Wildlife estate. Permits are typically required for visitors wanting to go out on country and see rock art. If you plan your itinerary well in advance many of the Aboriginal communities have websites and permits can be purchased on line before arriving. There are two clusters of rock outcrops near the King Edward River Crossing on the track to the Mitchell Plateau. The Wunambal people know this area as Munurru, the borderland between their tribe (language group) and that of the Ngarinyin people to the east of Mungara, the King Edward River. Today, Wunambal people live at Kandiwal and Kalumburu to the north and around Derby to the east. The first rock cluster is located 700 metres after crossing the King Edward River heading westward, and the second cluster is approximately 4.5 km along the Mitchell Plateau track after leaving the river, heading north-west. For the purpose of describing the rock art at these clusters, they are referred to as the Wanjina Complex and the Brolga Complex, respectively. Each of these complexes contains a number of rock art sites, and each site contains one or more art panels. This area of the Kimberley consists of open woodland on flat to gently sloping ground. Access to the Munurru sites is seasonal because this part of Australia lies within the tropics. Art motifs found at the Munurru sites include Wanjina deities, ceremonially decorated human figures (Gwion paintings) and plants and animals occurring in the landscape. Visit Kimberley rock art styles for more information. Gwion Group Dynamics – Image courtesy of Grahame Walsh archive. Copyright owner reserves all rights. The work of the Foundation allowed me to learn about the history and stories behind each of the artworks, giving me a different perspective of the Australia I thought I knew and the incredible history behind it. Knowing that the Foundation is working to understand the rock art and preserve it for the future, brings about a sense of gratitude: that I was given a chance to see it and future generations will be able to as well.